Publication History: This article is based on Chapter 8 of "The Log Analysis Handbook" by E. R. Crain, P.Eng., published by Pennwell Books 1986 Updated 2004. This webpage version is the copyrighted intellectual property of the author. A handy rule of thumb can be used to estimate water saturation in many zones. The rule is based on the observation that the product of porosity and water saturation is constant for a particular rock type, which is confirmed by core analysis studies. We therefore do not require knowledge of water resistivity, which is one of the most difficult interpretation parameters to find. The concept was originally developed by R. S. Buckles, published as "Correlating and Averaging (ornate Water Saturation Data", presented at the 16th Annual Technical Meeting, P&NG Division, CIMM, Calgary, May, 1965. 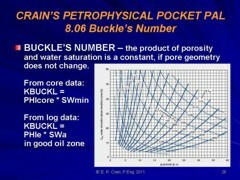 The technique is often called the "Buckles' Number" method, where Buckles' Number is the product of porosity and irreducible water saturation. In his original paper, Buckles proposed that SW = Constant / Porosity. In this Handbook, we have named the constant KBUCKL and extended the model to shaly sands by adding a (1 - Vsh) term. In shaly sands the KBUCKL is held constant at the value for a relatively clean sand and the shale term effectively varies KBUCKL in proportion to the shaliness. Averages should be taken over intervals with constant rock type (pore geometry / grain size and sorting). In the log analysis cae, some assurance that SWa = SWir is required (eg. clean oil or gas production with little water). water saturation crossplot. Permeability usually varies with both PHIe and SWir, shown by diagonal lines on this plot. For equation 2 to give reasonable results, the zone must be known or presumed to produce hydrocarbons with little or no water cut on initial completion. KBUCKL will vary with changes in grain size, sorting, and overall pore geometry, so a particular value is often associated with a particular rock type. 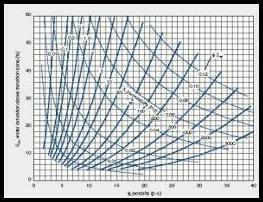 A table of porosity - water saturation products (KBUCKL values) is listed below in the Recommended Parameters section. Your own data should be added to the table shown later on this page. Such data can be found in technical publications and trade journals, from good log analyses where RW is known, as well as from special core studies (capillary pressure curves). Buckles' Number, porosity, irreducible water saturation, and permeability are intimately linked by the texture and pore geometry of the rocks, as shown in the crossplot given above. Use this method when RW is unknown and zone is KNOWN to be hydrocarbon bearing. Do not use in water zones. The product of porosity and water saturation, PHI * SW, in many rocks is a constant, and the product is called Buckles' Number, after the man who first described this factor. KBUCKL is found in a clean hydrocarbon bearing zone with a known RW and is used in other zones of similar rock types where RW is unknown. It can also be found by plotting core porosity vs wetting phase saturation at an arbitrary capillary pressure from special core analysis data. If regression is used to determine SW from PHI, the relationship is usually hyperbolic (KBUCKL = constant) or a skewed hyperbola (KBUCKL varies with porosity). The shale term has been added by the author to raise KBUCKL and SWp, automatically for the finer grained nature of shaly sands. Hydrocarbon zones with water saturation (SWa) above irreducible saturation (SWir) will produce some water along with hydrocarbons. This can occur in transition zones between the oil and water leg, or after water influx into a reservoir due to production of oil or gas. Use these parameters only if no other source exists.